Spices take center stage in Indian cuisine. Photo by Len Villano. Archana Patel isn’t much for being interviewed or photographed. Or sitting down for that matter. The woman behind Door County’s only Indian cafe simply loves to cook and peninsula foodies are happy she does. While the breadth and quality of the peninsula food scene has grown tremendously in the last decade, ethnic food remains in short supply. 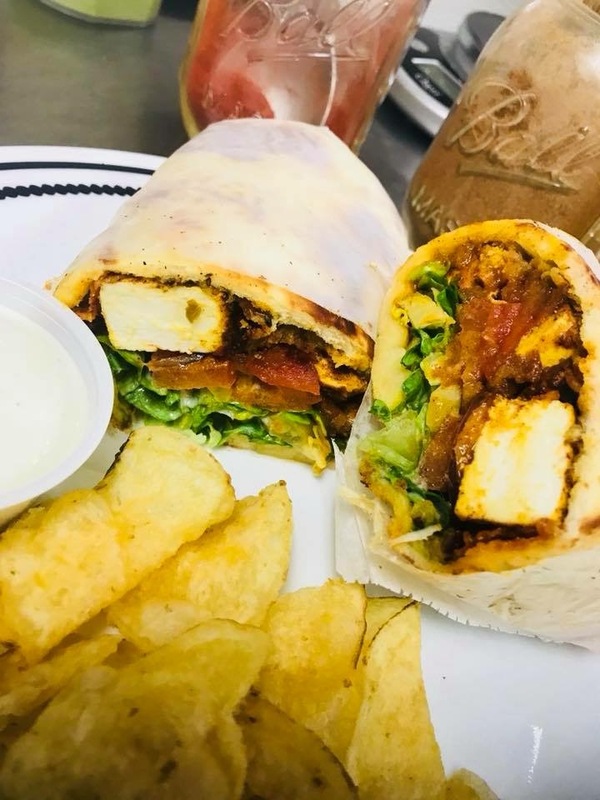 Some of the best is found at Kinara Urban Eatery, located inside the Hol-N-One Mobil station on Sturgeon Bay’s west side. The name is Hindi for “water’s edge,” appropriate for its location just a short walk from the shores of Sturgeon Bay. Hindi is one of three languages Patel is fluent in, in addition to English and Gujarati, the language of her birthplace in Borsad, India, in the state of Gujarat on the western edge of the country. Her family moved to the United States when she was 12, settling in Lenox, Massachusetts, where she caught the cooking bug early on. 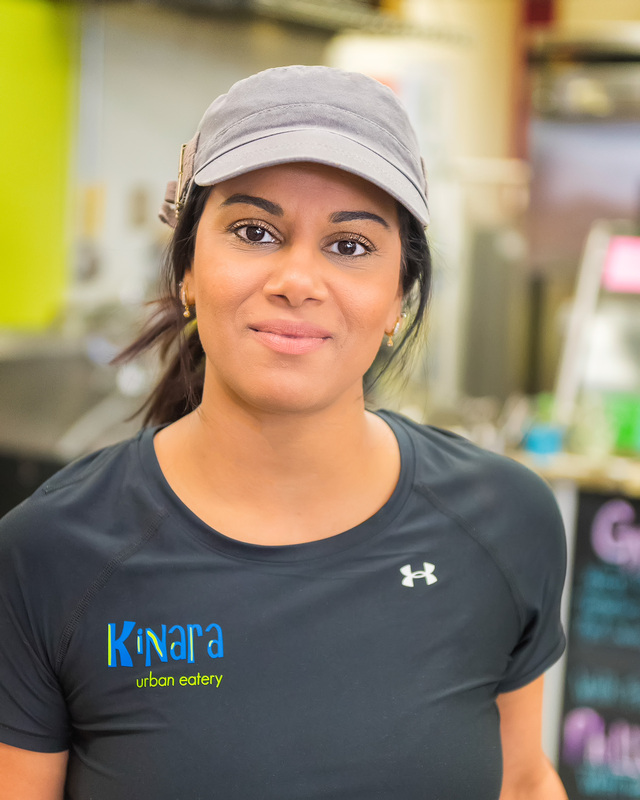 Archana Patel, owner of Kinara Urban Eatery on Sturgeon Bay’s west side. Photo by Len Villano. She didn’t follow her brothers into cooking school. Instead, she spent 13 years in Health Information Technology, but grew bored. “I missed cooking,” she said. While her husband was educated as a chemist, his family is steeped in the hotel/motel business. They soon followed, taking over the Quality Inn on the city’s west side 14 years ago. Five years ago a friend suggested they consider buying the gas station on the corner of Madison Avenue and Maple Street. Inside was a small commercial kitchen that was once home to the first Sonny’s Pizza location. One look at the kitchen sold Archana on buying the gas station. With the cafe she can get her fix in the kitchen without managing a huge staff or working late nights. The lunch counter is open 10 am – 3 pm, Monday through Saturday, with curries and rice available to go from the cooler all day. Patel has grown a following not just because she’s offering something different, but because she’s offering something far more than pre-made, re-heated or microwaved gas station fare. She started with just a couple of Indian dishes in addition to an array of classic grab-and-go fare like Chicago style hot dogs, gyros, and hamburgers, but customers quickly took to the city’s only Indian food option. She makes her curries fresh from scratch, with no canned ingredients or coloring, offering lamb and vegetable curries, palak paneer, and chicken tikka masala, as well as samosas, an Indian turnover filled with potato and peas. Fresh kati rolls with lamb or chicken, similar to a gyro, are popular lunch items, and customers keep an eye on her Facebook page to keep up with specialties like kale fritters, chicken kabob over garlic and turmeric rice, vindaloo, and vegan specials. She is particular about her spices, which are crucial to Indian cuisine. Of India’s 1.3 billion people, approximately 400 million are vegetarian, and many more eat meat only rarely. While Patel will cook lamb and chicken dishes, she has never cooked beef. In the United States protein is usually the centerpiece of a meal, but in Indian cuisine spices take center stage, which demands higher quality. 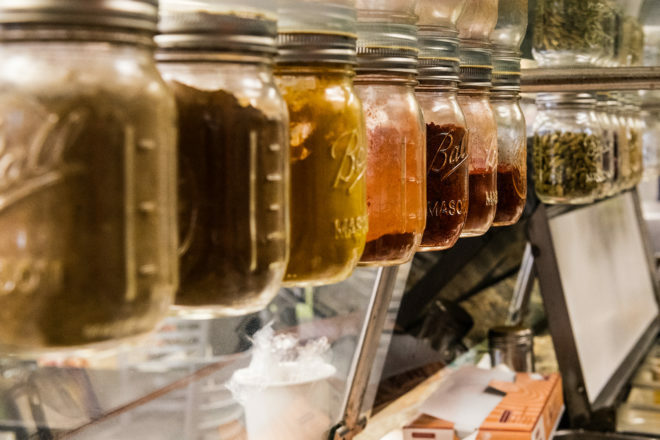 Patel occasionally makes trips to Green Bay and Chicago to track down more obscure ingredients, but likes to get one particular spice, turmeric, direct from India. This attention to detail extends to all of her ingredients. She gets her lamb from Strauss meats and chicken from Waseda Farms when available. She gets produce from Sully’s Produce, a southern Door County grower.